Upon assessment of the newborn and diagnosis of DS initial postnatal support is required. This includes early recognition of cardiovascular disorders (CHD), most common in neonates with DS, followed by respiratory, gastrointestinal, haemato-oncological and endocrine disorders (Weijerman & Winter, 2010). Special attention is required to hearing and vision disorders as they obstruct the learning of language and social interaction. Otitis media is of particular concern as it can cause fluctuating hearing loss (American Academy of Pediatrics, 2004). Anomalies of the musculature, nerve innervation differences, an enlarged tongue accompanied by apraxia and dysarthria are associated impacting the intelligibility of speech (Roberts et al., 2007). Communicative interventions as early as the first month of life show positive results at 18 months of age while language development continues without ceiling until at least 20 years of age (Roberts et al., p.29-31). Delayed motor development in children with DS can be addressed with additional training e.g.,by practice walking while increasing opportunities for active movement. Children with DS tend to be slower to react and initiate movement, have more difficulty in maintaining balance and perform better when goals are supported visually (Sacks & Buckley, 2012). Cooperatively working early intervention teams include physical- and occupational therapists, speech language pathologists assisting with language acquisition and development teachers supporting the child’s individual development, family situation and community integration. The efficacy of such interventions can be attributed to the brain’s neurological plasticity, in particular in regard to creating early positive and firm neural connections. Gross and fine motor skills are a prerequisite to support goal-directed intentionality of action and support subsequent cognitive processes. Social independence as an adult is strongly associated with learning how to complete tasks without assistance in pre-school and school and to engage in recreational and social activities beyond the classroom to reinforce skills (Weijerman et al., 2010). This entails non-discrimination of the social environment (Nevel, 2010) and institutionalized support such as employment programs for people with DS. employment, sheltered employment or alternatives to employment (ATE) as active members of society (Foley et al., 2013). Government support such as developmental disability programs are thus of the essence to foster social integration (Hubler & Ebsworth, 2009). Parents are required to arrange for long-term medical supervision as well as long-term living arrangements or estate planning (Smith, 2001). Dementia of the Alzheimer type is the most common disorder for people with DS in middle age, with an average onset in the early to mid 50s (Torr et al., 2010). After age of 35, mortality of people with DS increases disproportionally. DS is suspected to share neurobiological mechanisms with Alzheimer. Pneumonia associated with Alzheimer disease is the most common cause of death for people with DS (Bittles et al., 2007) while aging is associated with a wide range of comorbidities such as sensory impairments, musculoskeletal disorders, for example osteoporosis, and orthopedic problems caused by osteoarthritis of the spine and hips affecting mobility (Torr et al., p. 77-78). The described challenges impose significant stress and worry about the future affecting people with DS as well as their caregivers. Caregiver support such as skills training, community integration and building institutional alliances such as nursing and health-care centers is warranted (Nevel, 2010). Looking holistically at the life span development and challenges of people with DS it becomes apparent that the social ecology (Bronfenbrenner, 1979) of nurture expands gradually from parental and therapeutic support at home to pre-school environments, school and further to workplace and governmental support frameworks. Compared to the past where people with DS faced lifelong institutionalization and development was regarded hard-wired, such a narrow view has been replaced by concepts of developing neuro-plasticity. Given adequate nurture, people with DS are able to live life to the fullest as valued and cherished members of society. American Academy of Pediatrics. 2004. Clinical practice guideline: Otitis media with effusion. Pediatrics 113:1412–1429. Demetriou, A., Christou, C., Spanoudis, G., & Platsidou, M. (2002). The development of mental processing: Efficiency, working memory, and thinking. Monographs of the Society of Research in Child Development, 67, Serial Number 268. Hubler, B., & Ebsworth-Goold, E. (2009). The New Path to Employment: Navigating Rocky Economic Times to Find Success in the Working World. Exceptional Parent, 39(10), 32-35. Nevel, K. (2010). Down syndrome and aging: a leadership and social justice landscape. Journal Of Cultural Diversity, 17(1), 34-38. Penrose, L. S. (1949). The incidence of Mongolism in the general population. Journal of Mental Science, 95, 685–688. Roberts, J., Price, J., & Malkin, C. (2007). 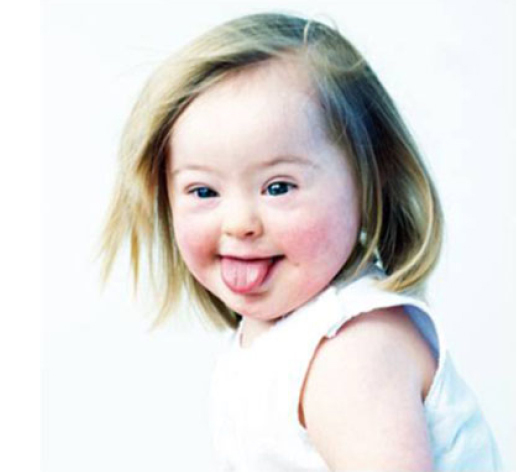 Language and communication development in Down syndrome. MentalRetardation And Developmental Disabilities Research Reviews, 13(1), 26-35.